Marvel’s Avengers: Age of Ultron may have only debuted a mere couple of months ago, but it feels as though the wait for Peyton Reed’s Ant-Man has stretched for years, perhaps prolonged by the abrupt departure of Edgar Wright from the director’s chair. It’s a switcheroo that fuelled concerns about the movie’s chances, and whether or not it could pull of a similar feat to Guardians. How and ever, this Friday will see a swath of those overhanging questions answered when Reed’s superhero flick debuts in theaters. Arriving at the tail-end of Marvel’s Phase Two, Ant-Man isn’t likely to be your typical origins film, considering that it has to build a world of its own all the while strengthening ties with the MCU. Be warned, herein lies spoilers. What exactly those ties will prove to be remains to be seen, but the company’s Studio Head Kevin Feige recently offered a brief tease of what to expect when Paul Rudd’s micro-hero takes to the silver screen. Specifically, Feige spoke about how Rudd and co-writer Adam McKay invented one of the biggest connections to the Avengers: Anthony Mackie’s Falcon. Beyond that, one of the biggest theories swirling around the four corners of the interweb has been relating to Janet Van Dyne’s Wasp. According to director Peyton Reed, those who keep their eyes peeled when Scott Lang enters the Quantum Realm will be treated to a surprise, while an end-credits scene will seemingly confirm Lang’s search for the wayward superhero after the events of the film. 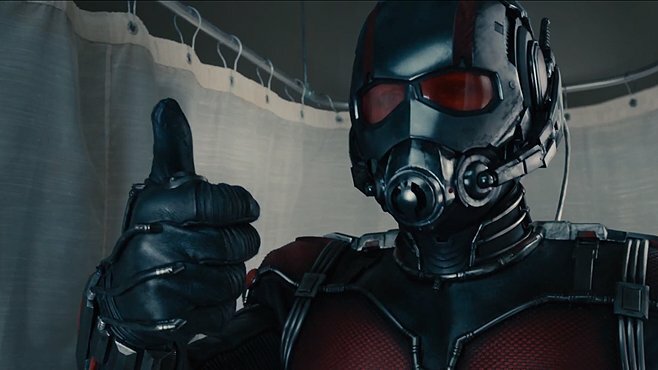 Ant-Man is poised to scurry into theaters on July 17. Tell us, are you anticipating the release of Peyton Reed’s superhero flick?